JQ Talks: I've Tried Our LOCAL BRAND SILENT SLOW JUICER! Did you know that Malaysia has our own brand of slow juicer? Thanks to a friend, Carole, for introducing this to me. I managed to collaborate with them and try out their juicer. It's call the Crego Silent Swirl Juicifier with the motto of 'The Ultimate Way Of Juicing". 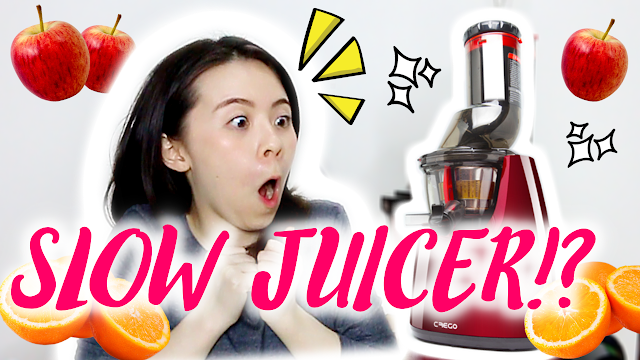 It looks pretty similar to a lot of other vertical slow juicer out in the market but pricing wise, truly, Crego is considered pretty reasonable (RM899) for people who are interested in a slow juicer for home/personal use. Do Like the video and Subscribe to my YouTube Channel! For most of us who purchase something online, of course we'll want them to be delivered asap. When I was told that they've already placed an order for my Crego, pretty much the next day, I got my package! I was quite shocked as I was not fully ready to start on my juice detox yet due to my hectic schedule. So the juicifier ended up at the corner of my house for a week before I finally did my unboxing video. It was overall well packed and came in good condition. You can see them in my unboxing video as above. I'm not the best at putting things together, I only somehow manage to do it when I really need to. To be completely honest, Crego's guidebook wasn't the most helpful for me, it does take some time to digest what are they trying to say for a newbie to slow juicer like me. However, once I kind of got it, it was pretty smooth assembly process from then on. I don't know about you, usually, ever since my right light bursting in front of my incident (video here), I got a little freaked out about turning any electronics on for the first time. Thankful for Crego, in the guidebook itself, it did say that the machine won't work if it's not assembled properly. Thus, I don't have to worry about it going crazy on me just because it didn't fix it properly. Plus, it also have other safety features such as Safety Magnetic Switch, Bladeless Design, Waterproof Plug, etc. One of the main reasons why I love Crego is because of the wide insert-mouth section. It's one of the criteria for me when I was researching on slow juicers. I wanted something like this because if I can, I'd prefer to reduce my work of chopping my fruits and vegetables into smaller pieces. Crego's inlet measures at 76mm wide, it's larger than the size of a tennis ball! I got so excited to see my whole oranges and apples getting squeezed in the machine. 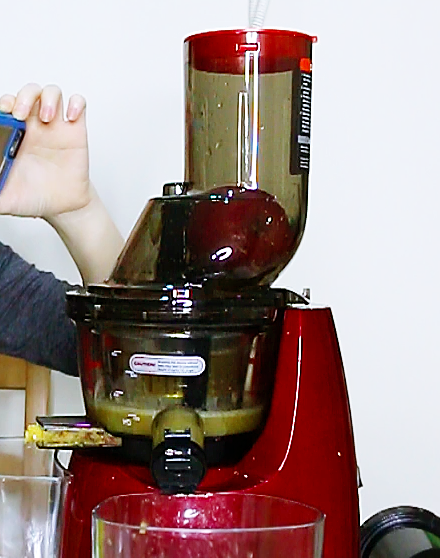 It was exhilarating to know that I can juice with less hassle whenever I want in the future. Just make sure to clean the fruits or vegetables thoroughly and juice one at a time. 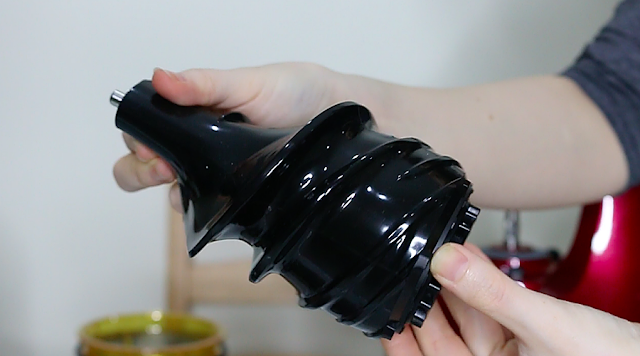 When it comes to slow juicing, the Auger (heavy black thing in the center of the machine) and the Rotations Per Minute (RPM) is an important factor to consider. For Crego, it has an elongated auger design where it introduce multi stage juicing to ensure most nutrients and enzymes are preserved, yielding a whole new enhanced natural taste. Crego's speed operates only at 43rpm, it seem to be at a slower speed as compared to a few other slow juicer brands available in Malaysia. The reversible motor allows powerful crushing force, imitating the masticating process that provides a glass of juice packed with yummy goodness. 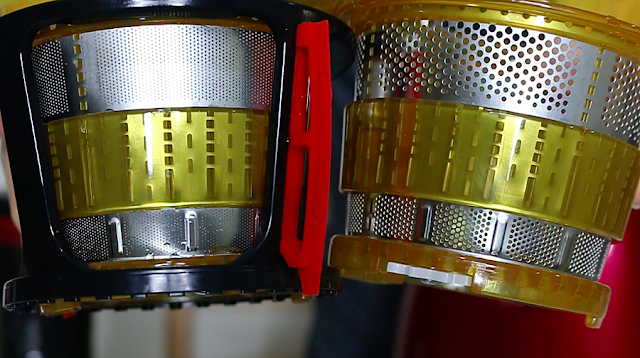 While researching for slow juicers, I find that some juicer only comes with one strainer, which can be quite limiting at times as I might be interested to make more than just juice. I'm glad Crego comes with two screening sizes strainer (coarse and fine) so I can choose to make a smoothie or a juice with more pulp. I remember doing my testing session at 12am and dexter was already in the room trying to sleep. In person, it was really low in noise. I asked Dexter if he heard anything while I was shooting, he said no. Didn't even know I started juicing anything. In camera it might sound a little louder on video as my mic was picking up the machine sound very well. The Silent Swirl Juicifier is equipped with 100% copper winding motor that delivers consistent power at a low noise of only 43dB, claims to be equivalent to the sound of gentle breeze. It's designed to ensure smooth and systematic rotation, operating at very low level of friction, which makes the machine a silent one. Check out my YouTube video on my 3-day juice detox experience! I'll do a separate blogpost on the juice detox topic. Sometimes, we want to juice a bunch together so that we can just do one time cleaning. Most conventional juicer don't allow you to keep your juice more than a few hours. With Crego, I get to juice and keep them in my fridge for up to 3 days and it'll still taste as good and fresh. Speaking about cleaning, Crego's machine is not too complicated. It's said that we can give a quick rinse first by adding water into the inlet before taking them apart for thorough cleaning. It's easy to dissemble and with the provided brush by them, made it even easier. Even though Crego did provide me this juicifier, I'm going to be honest, there is one downside. I was juicing a bunch of vegetables for my 3-day juice detox and I realise with vegetables like celery and spinach, if I'm juicing a whole lot of them at once, the fibres of the vegetables will get stuck after a while. I believe it was because I didn't give it enough break time as I keep on juicing and juicing those full of fibres kind of vegetables. However, if you are not juicing too much of fibrous vegetables, Crego should work fine. I highly recommend reading the instructions as it did still suggest chopping up the ingredients before juicing and give the juicifier a short break after 30 minutes continuous use. I personally don't think you'll need to chop everything, only specific kind of fruits and vegetables that are super fibrous requires chopping into small chucks, while others like apples, oranges, carrots, cucumber, you can probably get away with juicing them whole. 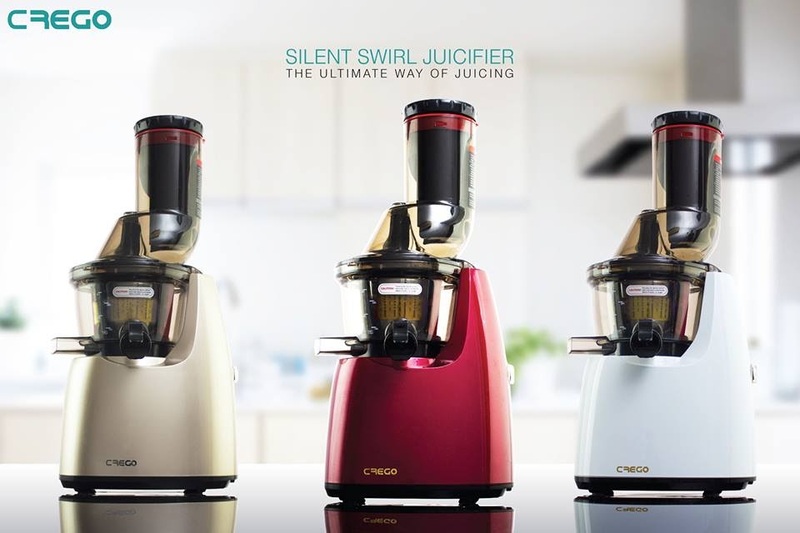 Crego Silent Swirl Juicifier comes in 3 colours at only RM899 each set with 10 year warranty for the AC motor. If you follow their Facebook page, sometimes, on certain joyous occasions, they'll have some promotion on their juicifier! For more information on Crego or to purchase, do visit Crego's official website.